Update: Many of you have asked me if I plan on releasing my sold-out Build Your Audience workshops as a stand-alone course. The answer is YES! Jump on my email list for updates! Imagine having thousands of people lined up to hear about your next project. Most people try to build a product first, and then find people to sell it to. My inbox is full of folks who've followed this approach, only to be disappointed because no one showed up to their launch. Successful product people follow a different approach: they launch their products to an established audience, and target a problem that audience shares. Why does this work? Because having your own audience is like having your own personal fan base. An audience will wait anxiously for you to release your new thing; instead of hearing crickets, you'll have sales on day 1. Are you stuck? Looking to get from 0 to 1,000? In every business I've run, there's been a common thread: the majority of my sales have come from my email list. For me personally, the magic started happening when I got 1,000 email subscribers. At that number, converting even a small percentage (say 2-3%) will net you 20-30 paying customers. You can get there. You can build a mailing list of 1,000. You can get your first 20 customers - in fact, you might even get more (my first book had a 20% conversion rate). Like what you're reading? Get my free weekly newsletter here. 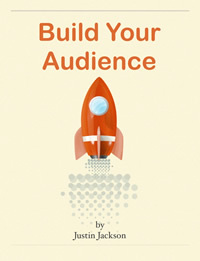 Ready to build your own audience? In the summer of 2012, something clicked: after years of struggle, I started focusing on a single audience. My blog posts started getting more traffic (80,000 views in a day), my mailing list grew to over 5,000, and my Twitter followers grew from 570 to 4,486. Today, my audience provides me with thousands of dollars each month in recurring revenue. By following some simple principles, you can build a profitable audience.